Lingerers. They’re a pain for busy servers who are trying to “flip” a table that’s done eating so they can seat another party. 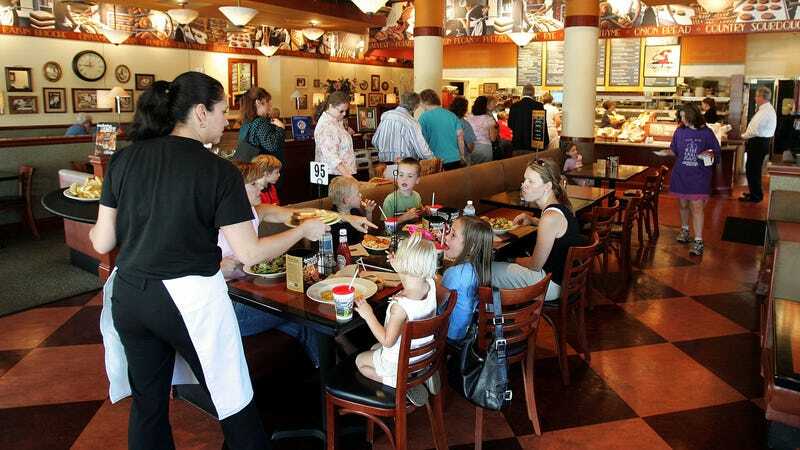 But tables who are seated longer also tend to tip more; so, what’s the ideal time frame? A group that sticks around for 80 minutes sees its average meal cost increase from $88.39 at 40 minutes to $123.45 at 80 minutes, but the revenue they generate drops from $2.21 per minute to $1.54 per minute between the 40- to 80-minute period. So while they’re still generating money for the restaurant and server, the 80-minute-long table would be more profitable if it was replaced with another table just beginning its meal. The report drew data from thousands of restaurants and millions of meals, Upserve’s director of PR and communications Carol Lin Vieira tells The Takeout, including quick-service, fast-casual and full-service restaurants. Another interesting fact from the report: The national average tipping rate is around 15 percent, with higher rates in the South and Northeast as compared to the Midwest and West, according to NRN. See the chart below for the breakdown, and hey Midwest/West, maybe let’s pony up another couple bucks—especially if you’ve been hogging that table for two hours.